UP TO 27 monuments at the Goldenbridge cemetery in Dublin have been destroyed in recent days by vandals who knocked over headstones smashing some into pieces. Today the Glasnevin Trust confirmed the vandalism of the Victorian and pre-Victorian monuments. In statement it said the cemetery has been the target of similar destructive vandalism on a number of occasions in the past couple of years. The trust has been engaging with gardaí to bring an end to what it described as “truly distressing acts of targeted vandalism”. Currently, Goldenbridge Cemetery is locked and visited by appointment only, given that there are now relatively few burials at the cemetery. Fine Gael TD Catherine Byrne said she was angry to hear about the vandalism. “I have been working for many years to try and get this historic cemetery reopened as a living cemetery so people from Dublin 8, 10 and 12 can bury their loved ones locally,” she said. After the Glasnevin Trust took on the project, it announced up to 1,000 grave plots could be made available. “These vandals and criminals will not stop this project going ahead and I am determined that local people will not be held to ransom by them. Local people should be able to bury their loved ones with dignity in this cemetery,” the TD said. 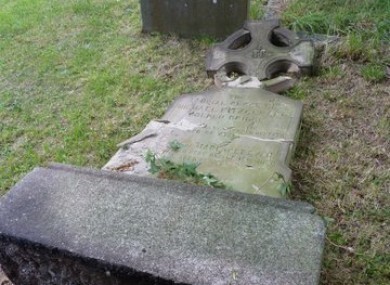 Email “27 headstones destroyed by vandals at Goldenbridge Cemetery ”. Feedback on “27 headstones destroyed by vandals at Goldenbridge Cemetery ”.